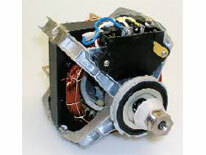 Dryer Motor SU SM279827 fits Whirlpool, Kenmore/Sears, Estate, Roper, KitchenAid and others. Dual shaft motor drives drum belt from one end and the blower wheel on the other end. The drive motor is mounted on the base of the dryer below the drum. Motor will fail to start when the drying cycle is initiated. Motor stops during dry cycle and then restarts after motor cools down. Check the drum bearings and idler pulley for smooth and easy rotation. Bad bearings can be the cause (instead of the motor) of either symptom 1 or symptom 2. If motor is not starting, check the door switch, start switch, and fuse for proper operation before replacing motor. For additional help troubleshooting your motor call the U-FIX-IT store for free assistance with diagnosis.